The iPad is the biggest product launch of the last few years. Google is the biggest provider of PPC ads. So really it was only a matter of time before the two would meet. Sure enough, Google has announced that online advertisers can now run iPad campaigns on their all-conquering PPC platform. 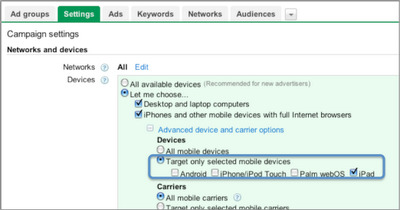 All you need to do is log into AdWords as normal and select 'devices' in 'Campaign Settings'. The resulting page lets you target 'desktop and laptop computers' and/or 'iPhones and other mobile devices with full internet browsers'. These include Android phones, the iPhone/iPod touch, Palm phones and now – you guessed it – the iPad. If you've somehow bypassed the Apple hype machine (although frankly, this is hard to imagine), the iPad is basically just a big iPhone minus the calls. Users can read e-books, watch HD videos, listen to music and so on, but it is web browsing that will really interest online advertisers. At its heart, the iPad can be viewed as one more medium for delivering traditional PPC ads. What is the iPad demographic? The ability to target early adopters with deep pockets (US prices range from £324 to £538) is obviously tempting. What's more, you can actually let tech-savvy consumers download your iPad app straight from the ad. To do this, simply link to the download URL of your iPad app in the text of the Google PPC ad. One thing worth pointing out, however, is that the size of the tablet market is still an unknown quantity in the UK. Pre-orders of the iPad won't start until May 10th 2010 (at the same time as Apple confirms the non-US price tag) and the first devices won't ship until the end of the month. But if experiences across the pond are anything to go by, the iPad could quickly become an important consideration for PPC advertisers. In the US, more than half a million iPads were delivered in the first week alone and Apple admits that the demand has far exceeded expectations. Apple even had to postpone its international rollout just to cope – the iPad was originally due to launch in the UK at the end of April.